MAC (Media Access Control) address is the unique hardware address that is bind to your network card by its manufacturer. It’s also called physical address. This address is commonly written as a sequence of 12 hexadecimal digits, such as 0C-0B-CD-34-54-A0. Valid hexadecimal characters are "0" to "9" and "A" to "F". 3) Command prompt window will appear. Type ipconfig /all. You can see the physical address of this network card is 00-0B-CD-34-74-A0. The card manufacturer shown is National Semiconductor Corporation. Note: Actually the prefix (first 6 hexadecimal digits) is used to represent card manufacturer. For this example, the prefix is 000BCD and somehow I found the manufacturer is Compaq!! My guessing... maybe this prefix is actually owned by Compaq. Who knows... You can check your card manufacturer here by keying in the prefix. 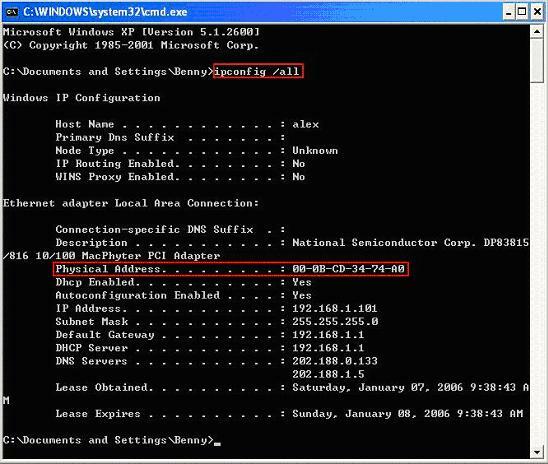 Note: DHCP and DNS servers’ information will be displayed by using this command as well. If you like, check out how to enable or disable network card after checking MAC address. Return to top of "How to Check MAC Address of Network Card in Microsoft Windows"! !